Today (December 8th) is the Feast of the Immaculate Conception, the Catholic teaching that, in preparing her to be the mother of Jesus, God gave Mary a singular grace that preserved her from Original Sin. As a Catholic, Tolkien was highly influenced by Mary. In fact, he once referred to Mary as the one “upon which all my own small perception of beauty both in majesty and simplicity is founded” (Letters 172). Since the feast of the Immaculate Conception is, in effect, the feast of the creation of Mary, I thought it would be cool to consider the Marian aspects of five of Tolkien’s Middle-earth characters. A disclaimer: I am not claiming that these characters are supposed to be representations or allegorical depictions of Mary, but simply highlighting certain resemblances. Varda (aka Elbereth) is the Valar known to the Elves as Queen of the Stars. When Sam is under assault by Shelob, he recalls the words of one such Elvish hymn (“Gilthoniel A Elbereth!”), and singing out to Varda, causes the phial of Galadriel to suddenly take light and blind the giant spider. With this, he gains victory against all odds. Sam’s invocation of Varda recalls the invocation of Mary by countless Christians over the centuries in the face of grave danger, and Varda’s title “Queen of the Stars” resembles the image in Revelation of the woman crowned with 12 stars, as well as Our Lady of Guadalupe. Like Varda, Nienna is one of the Valar, and she is known for her tears. Whenever some great tragedy occurs, Nienna often arrives to wash things with her weeping, and her tears bear powerful witness to the sufferings of others and plead their cause. It is interesting to note that Gandalf was a disciple of hers, and it is said that of her he learned pity and patience, which would serve him well on his mission to defeat Sauron. Like Nienna, one of Mary’s titles is “Queen of Sorrows” because of the prophecy that a sword would pierce her heart, and for her helpless presence at the death of her only son. Galadriel is one of Tolkien’s most complex figures, and he himself admitted that there was a certain resemblance between her and Mary. However, as a good Catholic, he drew the line in noting that while Mary was sinless, Galadriel was not. In bestowing useful gifts (such as the aforementioned phial) on the members of the Fellowship as they were heading out of Lothlórien, she resembles Mary under the title “Mother of Graces” as she bestows heavenly gifts upon those in great need. For a lot more on Galadriel, listen to the episode “Concerning Galadriel” on The Tolkien Road Podcast. A Marian figure need not be a female. In fact, Frodo is perhaps the most Marian of all of Tolkien’s characters because of his simple “Yes” at the moment it most mattered. Like Mary at the Annunciation, when faced with the prospect of a task seemingly beyond his stature and capability, Frodo proved himself to have a greater heart than any of the great ones gathered around him. By humbly abandoning himself to providence, regardless of the pain and suffering that lay ahead, it is Frodo that crushes the head of Sauron, much like Mary, as the New Eve, crushed the head of the Serpent. 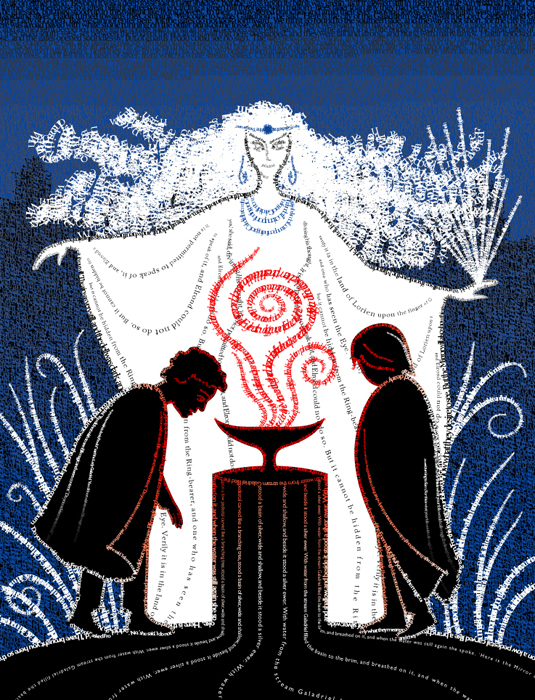 Have you noticed any other Marian allusions in Tolkien’s works? I’d love to hear about them in the comments below. Hey there fellow travelers! Welcome to The Tolkien Road, a long walk through the works and philosophy of J.R.R. Tolkien. On this episode, we continue through The Lord of the Rings with Book 2, Chapter 6, “Lothlórien.” By the way, if you haven’t already, please leave The Tolkien Road a rating and feedback on iTunes. We’d love to know what you think of the podcast. Enjoy the show!